Prepare the best fit pants. If you don’t have it, use the pants close to it. Place it on the flat surface. And smooth the fabric out with them. Open the leg and place inseam in the center. Measure it from center of the crotch (center of double stiches) to the hem along the seam. Unfold it. Measure it horizontally from inside of the thigh (crotch) to the outside. Measure it from end to end. The length of the Rise is the pants Length minus the Inseam. 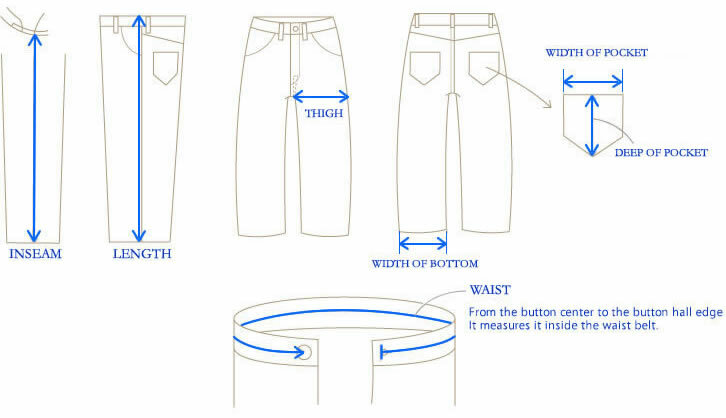 Measure the inside of waist, from the center of button to far edge of the button hole. Measure it horizontally from end to end. Measure it vertically from top of the pocket to the bottom. Prepare the best fit shirts. If you don’t have it, use the shirts close to it. Please remind to smooth out a wrinkle with hand before the measurement. Unfold and place it front side up. Measure it horizontally from top of the armhole to the other side. Measure it horizontally from bottom of the armhole to the other side. Please remind to get rid of wrinkles well. Place it back side up. Measure it vertically from neckline to the bottom. Measure it from top of the armhole to the cuff. Measure it vertically from bottom of the armhole to the sleeve. Place the measure at right angles to the sleeve.